Ahoy, matey! 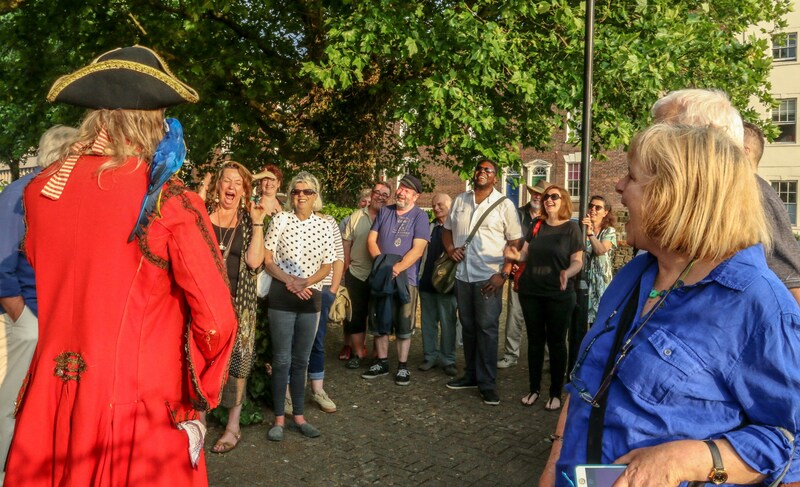 Batten down the hatches because there’s a new Bristol walking tour in town – the new Blood, Booze and Buccaneers tour! New revelations from Jamaica have evidenced that the prolific pirate Blackbeard was Bristol-born. And perhaps even more mind boggling, is the profound maritime history that’s embedded in Bristol’s historic harbourside in plain sight. 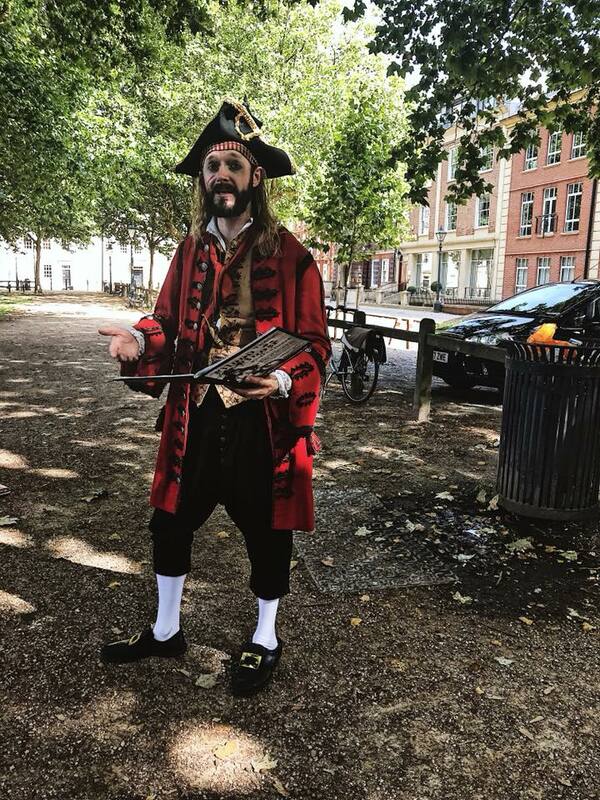 They say Long John Silver’s Treasure Island voyage began in Bristol – probably! 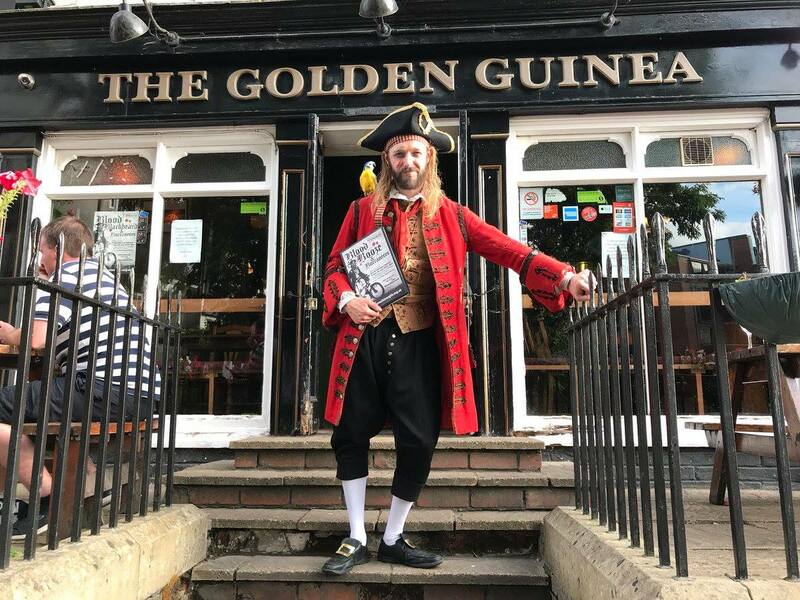 This Bristol walking tour begins in the Golden Guinea on Guinea Street, a very apt beginning given the street’s association with not only the gold coin that gets its name from the West African coast in which the gold was sourced, but the claim that Blackbeard’s own mother worked as a cleaner on Guinea Street. Those wanting to throw ‘three sheets to the wind’ can arrive early for a hearty rum in Bristol’s ‘best backstreet boozer’, before being led to the lounge for an introduction. It’s almost as if actor Gerard Cooke was born to play the role of Pirate Storyteller with his blonde shoulder length hair. With the adorning pirate hat, guy-liner and full costume it’s almost as if he was under Queen Anne’s rule himself. Accosted with some – questionable – pirate jokes, we all learnt how adding ‘arrr’ to almost any answer results in a pirate joke. What’s a pirate’s favourite vegetable? An arrrtichoke. You see? Almost upstaged by the pub cat, Gerard began his script with an introduction to Edward Teach – Blackbeard – and his association with Bristol. I’m not going to name the facts and fiction that he delved into, because that’s for you to discover on your own tour. But I will tell you our next destination on this Bristol walking tour: Redcliffe Caves. Well, more specifically Redcliffe Parade that offered a lovely vantage point of the harbour. Ignoring the smell of marijuana, and the swaying teenagers whose interest peaked as we neared, I can only imagine how much more thrilling it must have been to hear from a live pirate under the influence. 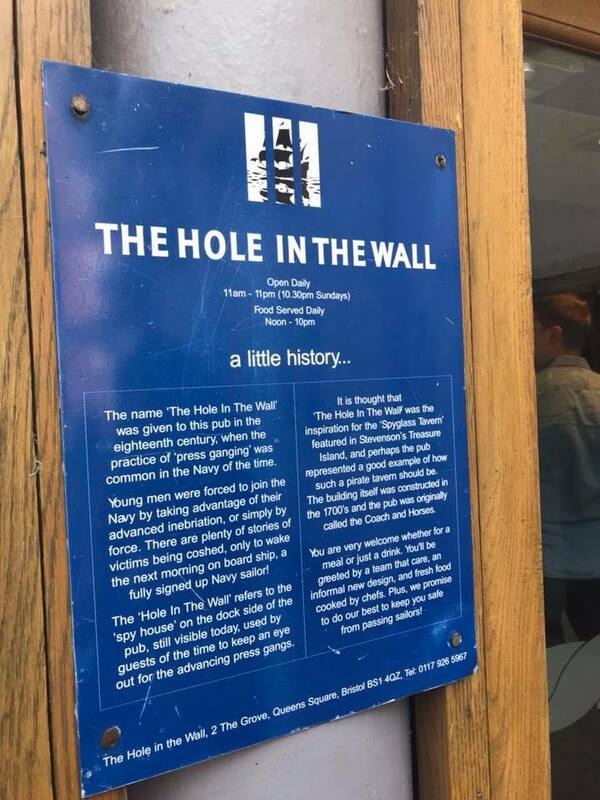 The Hole in the Wall was our second watering hole on this Bristol walking tour, with a second opportunity to grab a drink. Queen’s Square is abundant with piracy, not only with its association to Queen Anne, but the tell-tale signs of what we only read about in storybooks today. On the building of Queens Quay is a blue plaque that reads ‘Woodes Rogers 1679 – 1752’ and this is where it starts to get really interesting. Woodes Rogers is a known English sea captain and privateer who captained the vessel that allegedly rescued marooned Alexander Selkirk, whose plight is believed to have inspired Daniel Defoe’s Robinson Crusoe. It’s really no surprise that King’s Street’s Llandoger Trow is the penultimate stop on this Bristol walking tour. The timber-built building just oozes myths and legends from its facade. The name dates back to its creation in 1664, when a captain Hawkins sailed a trow between South Wales and Bristol, naming the pub after the Welsh village of Llandogo on the River Wye, where ‘trows’ were once built. And if you remember earlier we referenced Woodes Rogers who allegedly rescued marooned Alexander Selkirk? 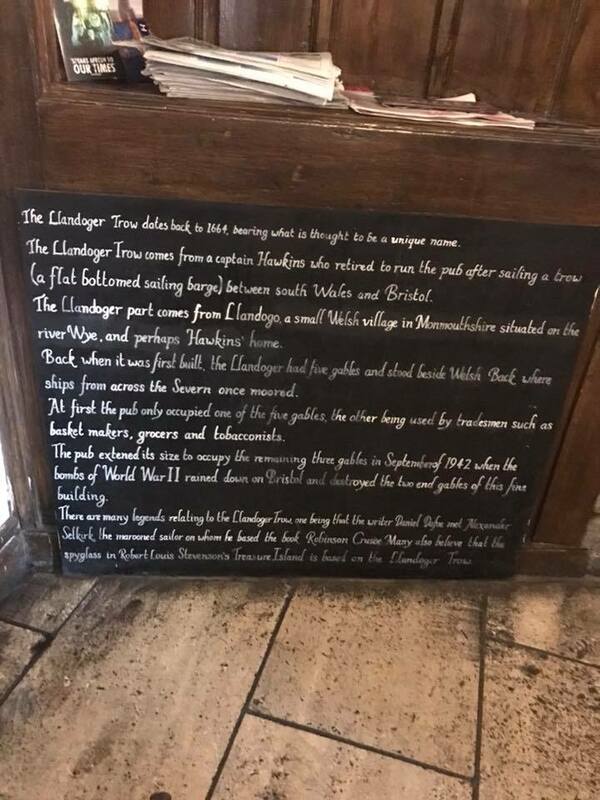 Well tradition has it that Robinson Crusoe author Daniel Defoe met the rescued Selkirk in the Llandoger Trow where he told his story. 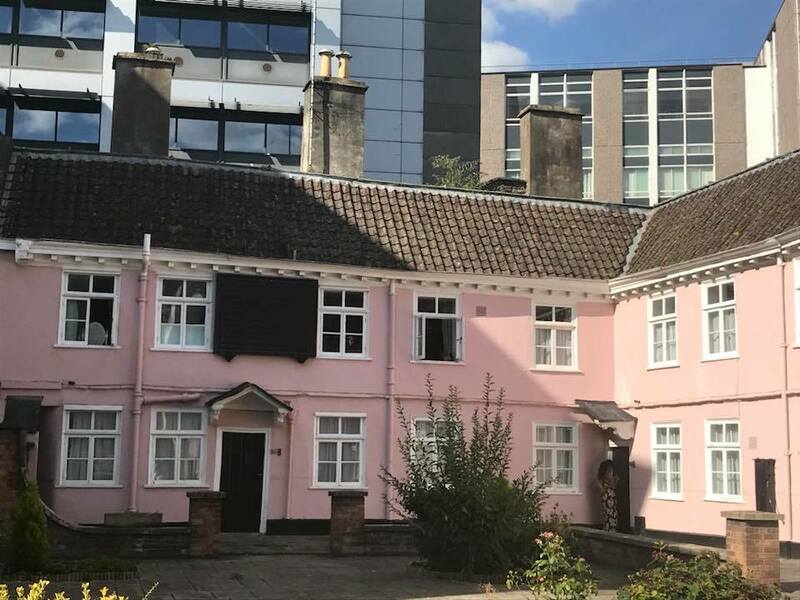 You’d be forgiven for thinking that the Merchant Almshouses on Kings Street were nothing more than a pretty pink courtyard. But these pastel accommodations once housed sick and elderly sailors. The tours run at 7pm on Wednesdays and 3pm on Saturdays until Wed 12 September, starting at The Golden Guinea. 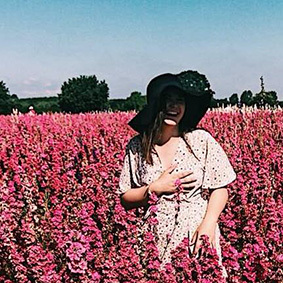 Tours cost £10 per person for the two hour tour available to book online here.